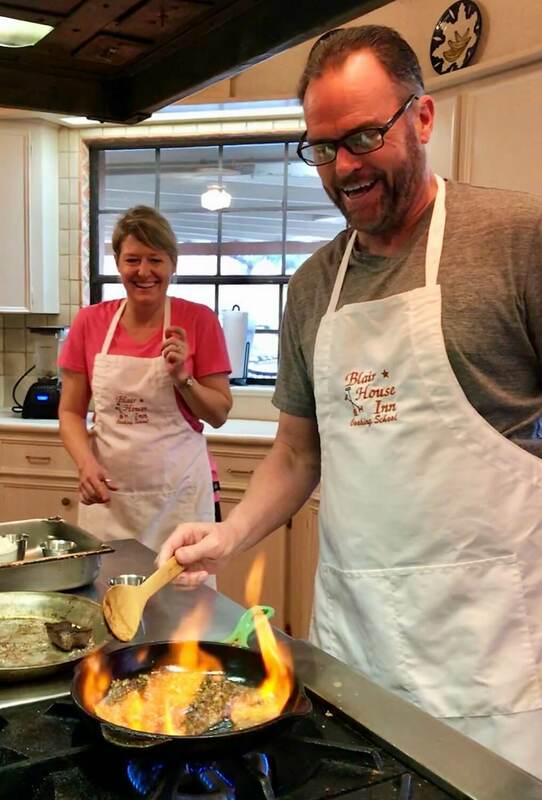 Our Three Day Texas Hill Country Cooking Classes are offered to our guests once or twice a month in a variety of exciting cuisines, all served with Hill Country flair! 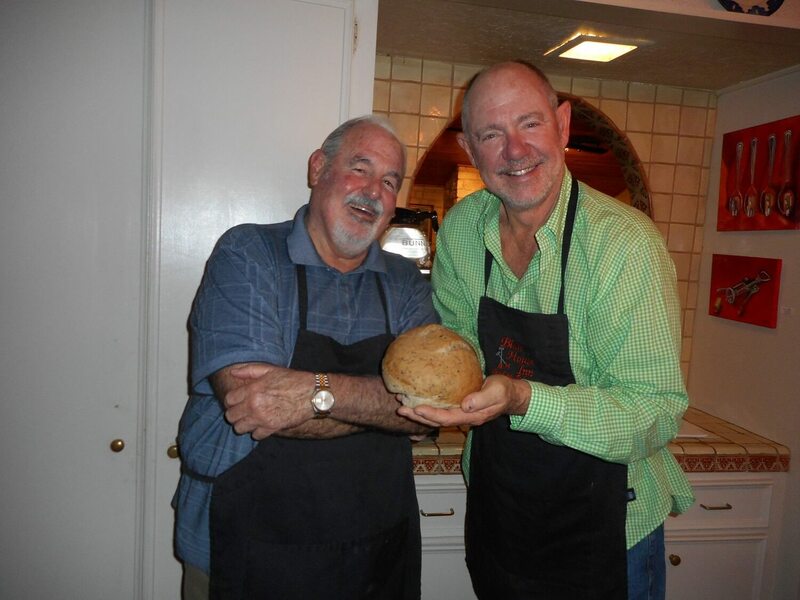 If you are passionate about cooking or even if you have always wanted to learn, but have never found the time, why not consider a cooking school in the beautiful and charming Texas Hill Country? Our group classes are available all year and are characterized by its use of the freshest ingredients, prevalently from the inn’s surrounding herb garden and local farmers, resulting in authentic Texas Hill Country cooking classes. Our students may participate in picking and collecting the herbs and have the certainty of always utilizing and eating 100% natural ingredients. In our school, you will not simply be a spectator but hands-on protagonist actively participating in approximately sixteen hours of six labs. You will participate in the preparation of two breakfasts, two lunches, and two dinners. After each lesson, you will enjoy the dishes you have prepared with your fellow students in a dining room setting with complimentary wine fitting the subject matter. The courses are specially designed to assist you to quickly and easily learn the secrets of the various dishes so that, once back home, you will be able to easily repeat the preparation of the dish and provide an amazing dinner that will astound your friends. 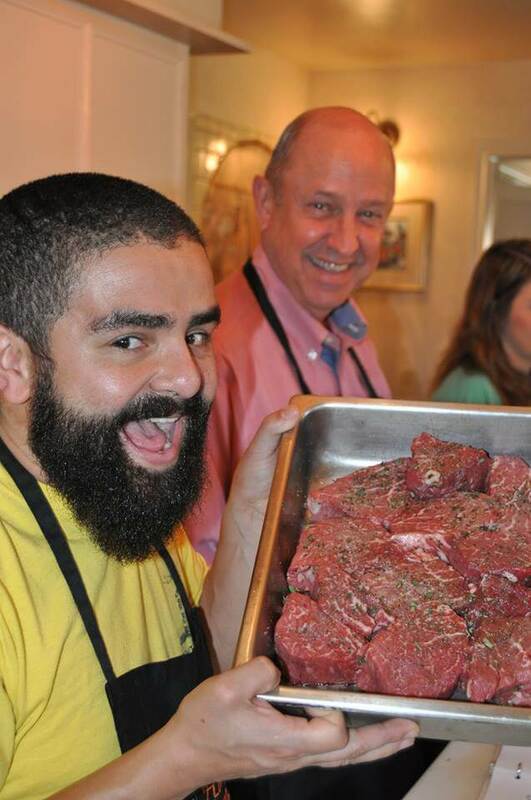 Schedule your classes today and share the joy of cooking with new friends in a relaxing atmosphere! Extend your stay to 3 nights and receive 10% off of the published rate of each room night. Classroom size is limited to no more than eight, to ensure individual attention. Food allergies should be mentioned at the time of booking to ensure exceptions can be made. Below you will find our themed three day classes to choose from. If you would like to schedule a private group class please feel free to contact the inn directly for assistance. Three day cooking classes are $300.00 plus tax and a $65.00 chef gratuity per person. Rooms and the Saturday evening dinner are additional. Blair House Inn also offers a "Tag-A-Long" feature for our guests. For those guests staying with someone registered for a cooking school and not wanting to participate in the class, but would like to enjoy the meals, a "Tag-A-Long" can be added. For $170 plus tax and a $31.50 gratuity, a guest can enjoy all the great food without the fuss of preparation. The best of both worlds! If you would like to add a "Tag-A-Long" to your reservation, give us a call at 512-847-1111 and we can book your cooking school today. Arrival at the charming Blair House Inn by 3:00 pm. Your first demonstration will begin with our Executive Chef in our commercial kitchen at 4:00 pm. After dinner, you participate in a short discussion with our Chef. This will include an itinerary and recipe assignments for the next two days. The chef will await you at 7:45 am and your first lab will begin by preparing breakfast. After enjoying your meal you will have a short break to explore the Hill Country and return to the kitchen by 10:00 am. At this time you will receive instructions and break off to prepare you assigned recipes for lunch. An afternoon break will be after lunch and at 3:00 pm you start to prepare your evening dinner. Once complete you will have a feast of the finest foods to enjoy and top the evening off. You will once again report to the kitchen at 8:00 am and begin breakfast preparation. A small break will be allowed and then you will enjoy preparing a picnic lunch to be taken on a Hill Country outing to a local Texas Winery or Farm. This will conclude your three day course at approximately 2:00 pm. April 29 - May 1: Spanish Cuisine – This class will teach the technique and history of Spanish cuisine. Traditional favorites like Paella and Arroz con Pollo will serve as a backbone for the flavors that make up Spanish style cooking. Enjoy Potato & Chorizo Trinxat, Tortilla Espanola, Salmorejo, and a traditional favorite- Cocido, a stew made with chicken, pork, chick peas, vegetables, and a smoked paprika. Discover the influence and taste of Spanish cuisine around the world. May 6 - May 8: Country French Cuisine – Our Chef Instructor will teach you basic French techniques that you can apply to all of your home cooking. In the process, learn how to make dishes like Steak Diane, Poulet Wellington, Raspberry Tarts, and Chocolate Crème Brulèe. Plus Sauces Francais 101! Never again feel like recipes are written in a foreign language! May 27-29: BBQ Camp – You’ll be the envy of your friends and family once you learn the secrets to preparing wonderful meals on the grill. Try your hand at Cedar Planked Salmon with Jerk Spice and Mango Avocado Salsa, Glazed Baby Back Pork Ribs, Smoked Beer-Can Chicken, Texas Brisket, and Peach Cobbler with Home-made Vanilla Ice Cream. June 10-12: Italian Cuisine – Come enjoy the taste of Italy as you prepare classic dishes such as Osso Buco Milanese, Roasted Red Pepper Risotto, and Italian Espresso Tiramisu. You'll also learn traditional Italian sauces such as Fresh Basil Marinara & Roasted Garlic Alfredo, and how to make fresh pasta and potato gnocchi. June 24-26: BBQ Camp – Summer in Texas means BBQ. You’ll be the envy of your friends and family once you learn the secrets to preparing wonderful meals on the grill. Try your hand at Cedar Planked Salmon with Jerk Spice and Mango Avocado Salsa, Glazed Baby Back Pork Ribs, Smoked Beer-Can Chicken, Texas Brisket, and Peach Cobbler with Home-made Vanilla Ice Cream. July 8-10: Mediterranean Cuisine – Let the Blair House take you on a culinary tour of the region from the Strait of Gibraltar to Cypress with plenty of tasty stops along the way! You will prepare Risotto, Hummus, Pita Bread, Pasta, Fruits de Mer, Calamari, Classic Greek Salad, Focaccia, Polenta and Crema Catalana. These are just a sampling of what you have to look forward to on your journey. July 22-24: Italian Cuisine – Come enjoy the taste of Italy as you prepare classic dishes such as Osso Buco Milanese, Roasted Red Pepper Risotto, and Italian Espresso Tiramisu. You'll also learn traditional Italian sauces such as Fresh Basil Marinara & Roasted Garlic Alfredo, and how to make fresh pasta and potato gnocchi. August 5-7: BBQ Camp – Summer in Texas means BBQ. You’ll be the envy of your friends and family once you learn the secrets to preparing wonderful meals on the grill. Try your hand at Cedar Planked Salmon with Jerk Spice and Mango Avocado Salsa, Glazed Baby Back Pork Ribs, Smoked Beer-Can Chicken, Texas Brisket, and Peach Cobbler with Home-made Vanilla Ice Cream. August 26-28: Classic French Cuisine – Learn the art of haute cuisine. Create exciting fare such as Cognac Shrimp, French Onion Soup, Coq au Vin, Steak au Poivre, and Beef Bourguignon. Learn the art of roasting canard (duck) served with an orange sauce. Prepare delectable desserts like Chocolate Torte with Raspberry Coulis and Crème Caramel. Our Chef Instructor will teach you basic French techniques that you can apply to all of your home cooking. September 9-11: BBQ Camp – Summer in Texas means BBQ. You’ll be the envy of your friends and family once you learn the secrets to preparing wonderful meals on the grill. Try your hand at Cedar Planked Salmon with Jerk Spice and Mango Avocado Salsa, Glazed Baby Back Pork Ribs, Smoked Beer-Can Chicken, Texas Brisket, and Peach Cobbler with Home-made Vanilla Ice Cream. September 23-25: Taste Of New Orleans – Spend 3 days & 2 nights in the beautiful Texas Hill Country while learning a variety of New Orleans cooking skills. This class will focus on the two main cuisines in and around New Orleans – Creole and Cajun – and will deliciously reflect their mix of Spanish, African, and French heritages. You will learn to prepare dishes such as award winning Gumbo, Blackened Snapper, Cajun Barbequed Shrimp, Louisiana Brined Roasted Loin of Pork, King Cake and the classic Beignet. October 7-9: Oktoberfest German Cuisine – The Texas Hill Country has a long tradition of German culinary influences. Experience Oktoberfest with Blair House Inn and learn some classic dishes, such as, German Pot Roast known as Sauerbraten, Pork Schnitzel, Bratwurst with Sauerkraut and Potato Pancakes, and Braised Red Cabbage. End your meal with rich German Black Forest Cake and Apple Strudel for dessert. I’m sure we will find some room for a German beer or two. Prost! October 21-23: Last Meal of the Titanic (French Flavors) – We pulled straight from the Titanic's first-class menus to deliver this unique culinary and historical experience. Learn how to cook dishes that were popular in the Pre-World War 1 era including Filet Mignon Lili, Waldorf Pudding, Consommè Olga. November 4-6: Hill Country Holiday Feast & Baking – Get in the mood for the Holidays. Learn a variety of ways to cook turkey and side dishes. Make holiday dishes such as Mesquite Smoked Turkey, Chocolate Truffles, Pumpkin Cheesecake, Ginger Cookies, Classic Pecan Pie, Sweet Potato Bruleé, Pecan and Sage Cornbread Dressing, and Sausage Stuffed Pork Tenderloin with Cranberry Port Glaze! Make this holiday traditional, but with a twist! November 11-13: BBQ Camp – You’ll be the envy of your friends and family once you learn the secrets to preparing wonderful meals on the grill. Try your hand at Cedar Planked Salmon with Jerk Spice and Mango Avocado Salsa, Glazed Baby Back Pork Ribs, Smoked Beer-Can Chicken, Texas Brisket, and Peach Cobbler with Home-made Vanilla Ice Cream. December 9-11: Hill Country Holiday Feast & Baking – Get in the mood for the Holidays. Learn a variety of ways to cook turkey and side dishes. Make holiday dishes such as Mesquite Smoked Turkey, Chocolate Truffles, Pumpkin Cheesecake, Ginger Cookies, Classic Pecan Pie, Sweet Potato Bruleé, Pecan and Sage Cornbread Dressing, and Sausage Stuffed Pork Tenderloin with Cranberry Port Glaze! Make this holiday traditional, but with a twist!